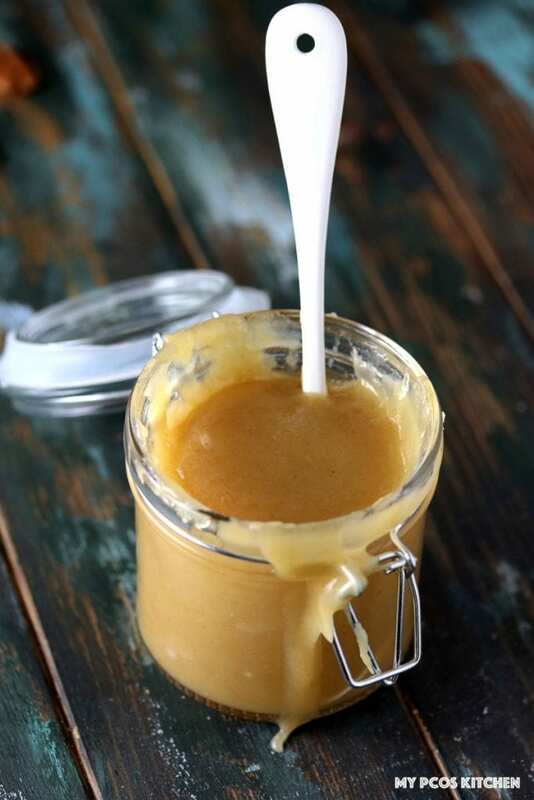 Forget sugar, try this amazing, thick and creamy Sugar Free Caramel! Can easily be topped over any dessert of choice. I’ve been wanting to make a Sugar Free Caramel sauce for a little while now, but never actually attempted making one that was sugar-free! 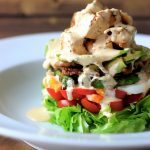 This sauce proved to be an interesting challenge as I learned a couple of things along the way. 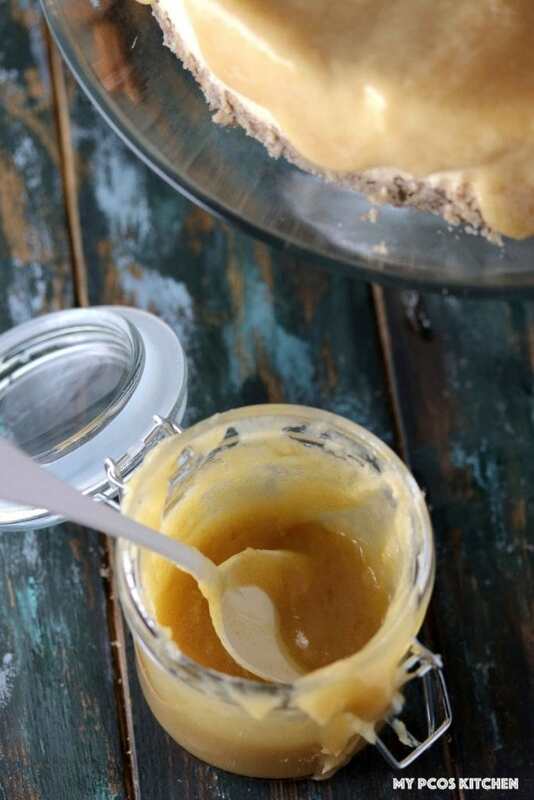 For a caramel sauce, you would usually brown some butter with some sugar and add cream at the end, but for a low carb version it’s a little bit trickier. 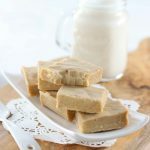 There are many recipes from other low carb bloggers that have made low carb caramel sauce, but most of them always use either a real sugar to stabilize it, or a high GI sugar alcochol (which I don’t have nor do they sell in Japan). 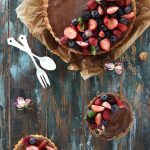 I wanted to avoid using any sugars other than erythritol, stevia or monk fruit as those three are the only sweeteners I allow myself to eat. 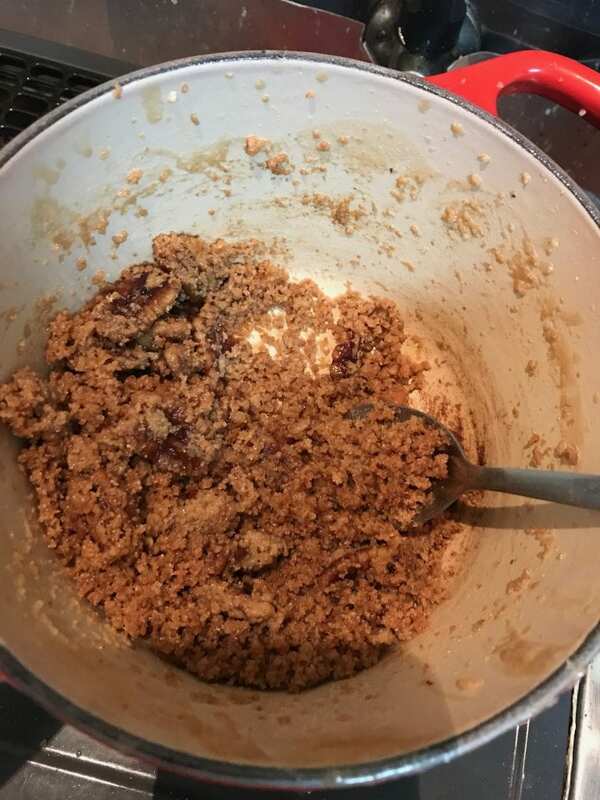 Another problem I encountered while making the keto caramel was that it was nice and creamy in the beginning, but as soon as it cooled into a glass jar or anything else, the oil and sugar would separate and the caramel would therefore be broken. Most low carb caramel sauces say to be served immediately as they don’t reheat very well. My goal for my sugar free caramel sauce was to make it so that: (1) it wouldn’t separate, and (2) it would reheat well. I ended up with a nice and creamy keto caramel sauce the first try, but as soon as it cooled down in a glass jar, the oil and sugar separated. When that happened, I put it back in the pot to heat it up again hoping that stirring would make it stick together again. It did, but to some extent. Then I remembered a recipe for Matcha Chocolate that I uploaded on my Japanese blog last year and here this year. where the oil and cream separated so I fixed that by adding some cashew butter and it became a nice and creamy fudge. I decided to try and add cashew butter to the caramel to see if it would stick together again. HAHA. Wrong idea. It did the total complete opposite and became this sort of granulated sugar! So PSA, do not add nut butter to this caramel sauce lol. I thought about what else I could do so that it would stick together even when cooled. My second try finally worked. I used an erythritol and monkfruit liquid sweetener from Lakanto to act as a substitute for real sugar and upped the amount of cream in there. It finally did the trick! For the sugar free caramel, I used homemade powdered erythritol instead of granulated because I find powdered one doesn’t crystallize as much when cooled, which is why in my Sugar-free Cranberry Sauce I made for Thanksgiving I used the powdered version instead of the granulated one. The lakanto sweetener I used is slowly getting popular in the United States. It’s originally from Japan so we have the liquid and granulated sweeteners everywhere at the grocery store. The liquid I used is actually clear in colour, but it has the exact same ingredients as the maple-flavoured one from the American Lakanto. It’s a sweetener made from erythritol (sugar alcohol) and monk fruit (a natural fruit extract with 0 carbs and a 0 glycemic index) and it’s actually one of my favourite sugar replacement, but since it can be quite pricey to use and buy, I prefer to use plain no-brand erythritol and stevia in most of my recipes. 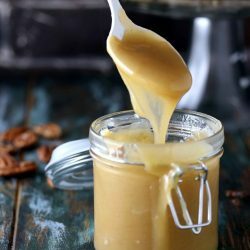 This keto caramel sauce was used in my latest Low Carb Caramel Cheesecake recipe and I topped with some pecans for it to be a sort of Pecan Pie Cheesecake. When the low carb caramel cools, it sort of becomes like a fudge consistency so I’m thinking that will be great for donut icing! 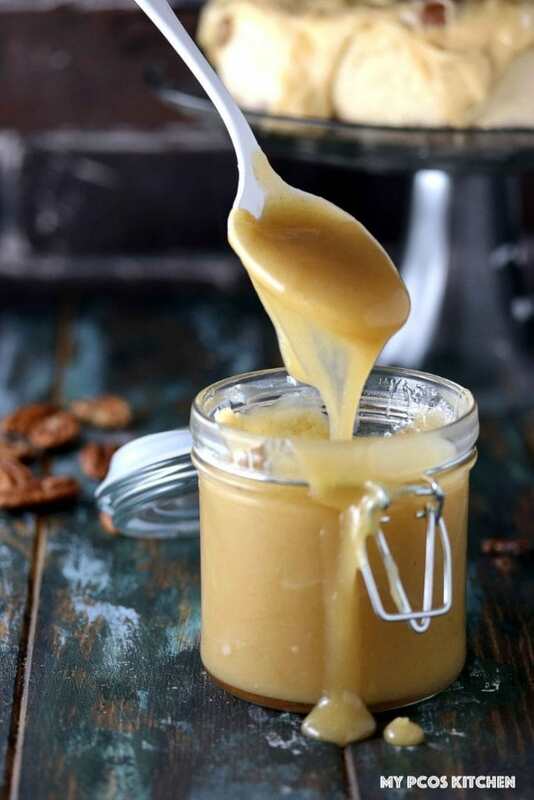 A delicious creamy low carb caramel sauce that is completely sugar-free! Once your pour the cream in, the pot will bubble like crazy, just make sure you continue to stir. The caramel will be very light in colour. Sprinkle in the xanthan gum, turn the heat back on to medium-high, and continue whisking vigorously for a good 1-3 minutes. The sauce will start to thicken even more and get more brown in colour. 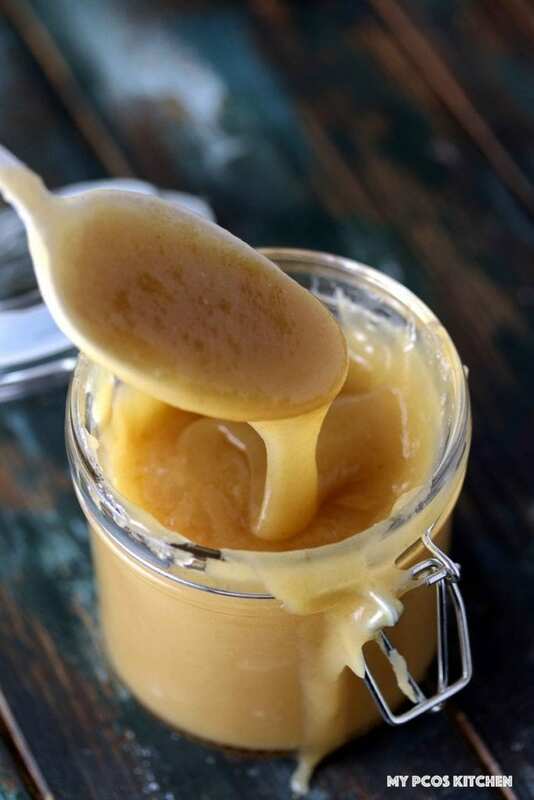 The caramel sauce is then ready to be poured onto any dessert, dipped in or spread on toast! Add the caramel sauce to a jar if you'll be using it for later and put it in the fridge to cool. It will completely solidify like hard fudge in the fridge. If you want to reheat it, do NOT microwave it as you'll break it. Instead warm it up in a double boiler with hot water at the bottom and the sauce in a bowl over. Slowly stir until the sauce kind of gets soft and that you can crush it with a fork. Then turn off the heat, and start whisking it and it'll eventually soften again! 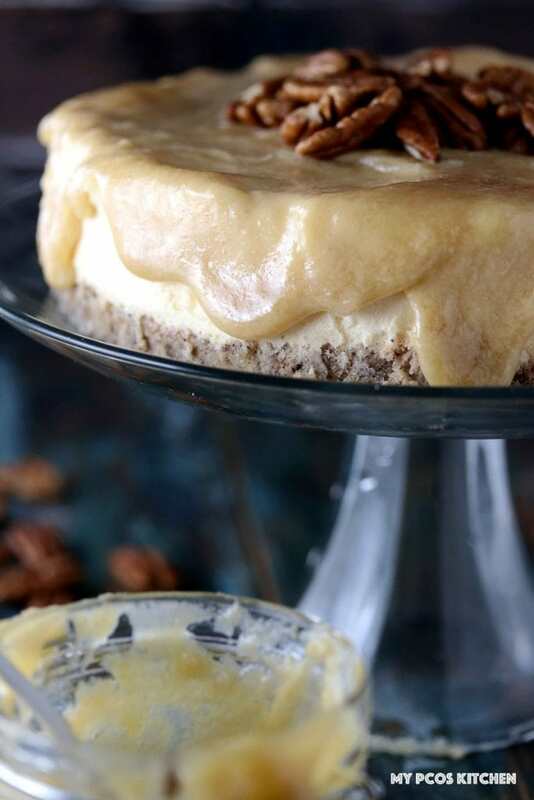 The recipe for the Low Carb Caramel Cheesecake is here! Could I substitute the lakanto maple syrup for the regular syrup? Do you think it would effect the flavor? Which regular syrup are you talking about? Hi Gigi, I believe you have to disable your adblocker to see the videos. They won’t show up while it’s on. I just made the low carb ke to biscuits. I took time to whisk all of the dry ingredients. The biscuits had a strong baking powder taste. Any thoughts on where I went wrong? Thanks! Are you sure you used baking powder and not baking soda? Baking powder doesn’t usually taste like anything, but baking soda does a lot! Thanks for all your efforts. I know how many times you try before you succeed! Success is not an overnight thing so you deserve all the stars!